Spicy food is one of my favorite things and I like my spicy food to be really spicy so I was happy to see this. I like spicy stuff so much that I’m usually that annoying guy in an Indian food restaurant that asks the chef to “Bring it on!” This sometimes results in serious pain, but it’s always fun and I just can’t get enough of the spice even if I know it is burning my taste buds off. 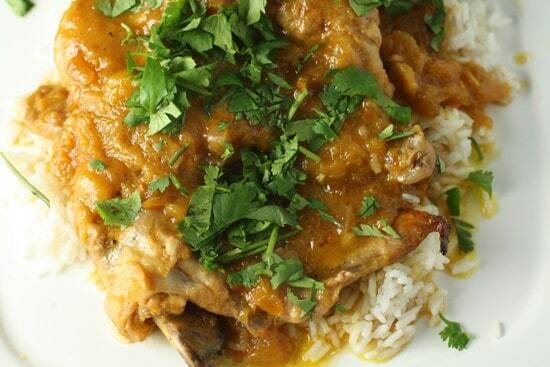 For this dish I cooked chicken slowly in a homemade mango and habanero sauce so it would absorb some of the flavors. It was spicy, flavorful and yet it was pretty light and summery due to the mangos. Quick Rant. Before I bust out the recipe I used for this, let me just say that I highly dislike it when grocery stores (especially high-end ones – I’m looking at you Whole Foods!) don’t keep their produce in the appropriately labeled bin. For example, when trying to buy some Habaneros for this dish, there were two different kinds of very small pepper in the bin marked habaneros. I knew only one of them was actually habaneros, but it was hard to tell which one. So I ended up buying five of each kind. And yes, I did ask an employee, but they had no idea. 3 Mangos or 1 30 Ounce can of Mango pulp which can be found at Indian food stores. 1) De-seed and dice the peppers pretty fine. Dice the mangoes. 2) To make the sauce, start by heating up the oil in a large pan. Add the onion, garlic, and peppers and sauté for 3-5 minutes on medium heat until they are soft. Then add the mangos and stir for 5 more minutes. 3) After 5 minutes, add all the other ingredients. Let the sauce simmer on low for 15-20 minutes. 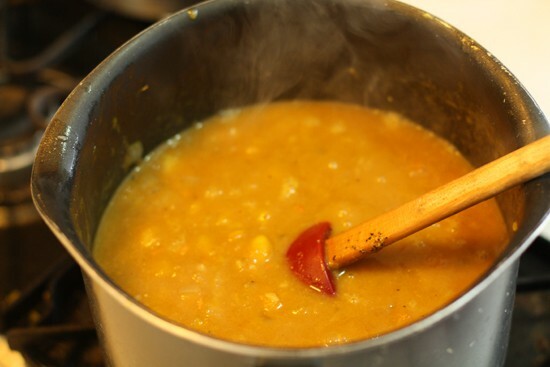 4) After the sauce has reduced a bit, taste it! Add some salt if necessary. Maybe add another pepper if the spice level isn’t high enough. 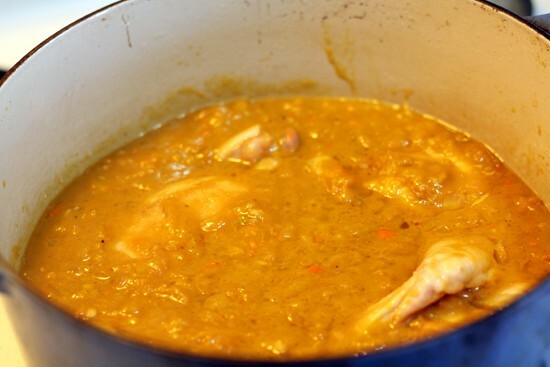 5) While the sauce is cooking, prepare the chicken. In an oven/stove top safe pan, heat a few Teaspoons of oil over high heat and then set the chicken in the pan for about 3 minutes per side. The chicken should brown nicely. 6) Then pour the sauce over the chicken (the sauce should still be boiling hot) and stick the whole thing in the oven for about an hour (30 minutes covered and 30 minutes uncovered) at 325 degrees. Note: If you don’t have a pan like that, you can sear the chicken in a standard pan and then transfer the chicken to an oven safe baking dish and cover with the sauce and cook for one hour at 300 degrees. You could cover the baking dish with foil for the first 30 minutes to mimic the first option. At the halfway mark and gently stir the chicken pieces around. 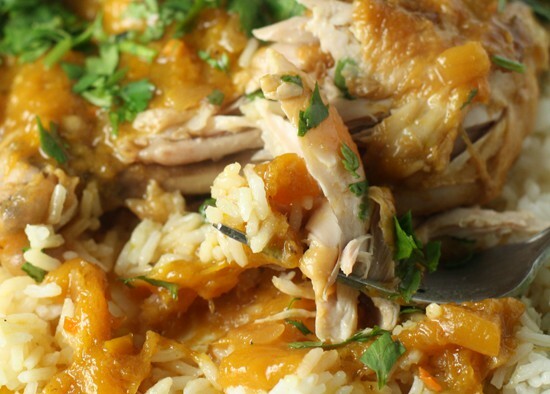 Serve over a bed of rice with some chopped cilantro as a garnish. Adapted from a ChileFire recipe. These are the fruits and veggies you will need. Notice the two different peppers. The smaller ones are deadly. The larger ones I could eat like an apple. HINT: The very small peppers are habaneros. The larger ones are impostors. After tasting and learning which peppers were the real deal, I decided to use both anyway, because I had them. 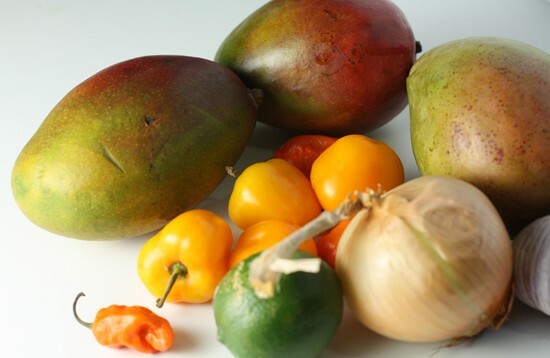 If habaneros were too hot for you, you could use something milder like a jalapeno, but the intense heat goes really well with the mango. De-seed and dice your peppers pretty fine. You can dice your mango loosely. It will dissolve mostly in the sauce anyway. As noted in the recipe, you will also need all of the below stuff. 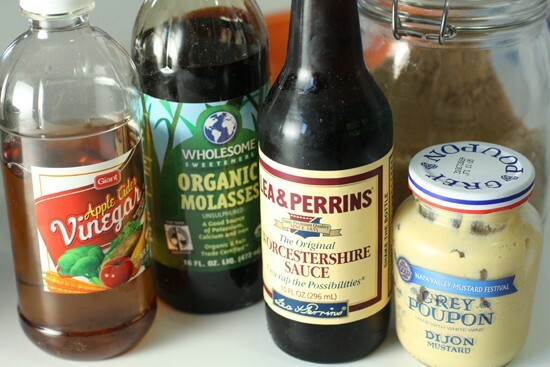 The original recipe called for way more molasses and Worcestershire sauce but I cut way back on both of those for fear that they would dominate the sauce. In fact, I think you could leave the molasses out all together or substitute honey for it. To make the sauce, start by heating up your oil in a large pan. Add the onion, garlic, and peppers and sautee for 3-5 minutes on medium heat until they are soft. Then add the mangos and stir for 5 more minutes. The mangos should release a lot of liquid and make a kind of soup. After 5 minutes, you can add all your other ingredients. Then let the sauce simmer on low for 15-20 minutes. It should reduce by about 1/4, but keep a close eye on it so it doesn’t burn or scorch! Stir it frequently. After the sauce has reduced a bit, taste it! Add some salt if necessary. Maybe add another pepper if the spice level isn’t high enough. Play around with it and have fun! While the sauce is cooking, you can prepare your chicken. I actually used a whole chicken that I cut up because that’s my preferred method, but you could use all boneless skinless breasts if that is your favorite. This is more than enough sauce for an entire chicken or 4-6 breasts depending on the size. In any event, once you have your chicken ready to go, there are basically two steps that we need to happen: 1) Sear the chicken on high heat in a few Teaspoons of oil and 2) Slow cook the chicken on low heat in the simmer sauce. If you have a pan that is oven safe and stove top safe (Le Creuset is the best but pricey, Lodge’s model has good reviews also), this is super easy. In your pan, heat a few Teaspoons of oil over high heat and then set your chicken in the pan for about 3 minutes per side. The chicken should brown nicely. Then pour your sauce over the chicken (the sauce should still be boiling hot) and stick the whole thing in the oven for about an hour (30 minutes covered and 30 minutes uncovered) at 325 degrees. If you don’t have a pan like that, you can sear the chicken in a standard pan and then transfer the chicken to an oven safe baking dish and cover with the sauce and cook for one hour at 300 degrees. You could cover the baking dish with foil for the first 30 minutes to mimic the first option. Because I was using a cast iron pan, I chose to cover my dish for 30 minutes which trapped in all the moisture and flavor and really got everything mingling together. Then I uncovered it for the last 30 minutes to let the sauce reduce further. This worked like magic. I also checked it when I uncovered it at the halfway mark and gently stirred the chicken pieces around. The slow cooking basically means that you can’t overcook this dish. The chicken will be super moist and flavorful no matter what. And the sauce, while kind of difficult to photograph, is very spicy but kind of sweet from the mangos and brown sugar. I served mine over a bed of rice with some chopped cilantro as a garnish. Tender and spicy. Very spicy. This dish was freakin’ good and spicy. I ate it for a few days in a row and it never got old. If you didn’t want it so spicy you could cut down on the peppers a bit, but I think the heat is lovely. Be sure to check back tomorrow for a new poll on what I should make next week and some other fun stuff! Still, it looks mighty good. I use this same method to make a version of chicken parm. w/marinara sauce. I think for the average home cook there is pretty much no better way to guarantee not-overly-cooked-to-a-state-or-rubber-bandedness chicken than this method. i am so down with this recipe, it looks amazing! i wanna try this too! i also love ridiculous levels of heat. the bigger of the two peppers looks like those mini bell peppers. probably good thing you bought both cause those arent hot at all and you coulda come home and been real disappointed! @Nick. Cilantro rules. I’ve heard that some people have a genetic aversion to it or something. Obviously it is optional. @mandi. That’s exactly what they were. Not spicy at all! 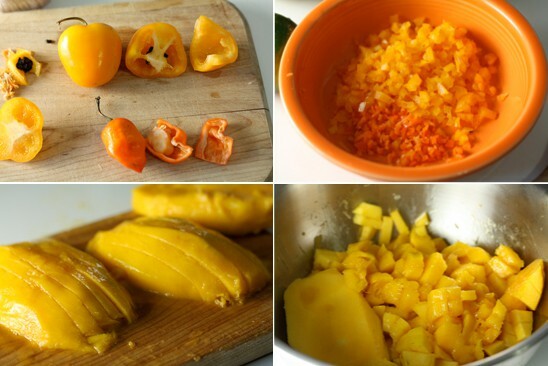 The habaneros are hot but they blend perfectly with the mango so the heat is pretty manageable I think. I would make it even hotter if I made it again. Also, I forgot to mention. Some people like to wear rubber gloves when dealing with these peppers because if you touch a pepper and then your eye or something it burns like you wouldn’t believe. Trust me. I know. Was it sweet at all due to the brown sugar? Could you perhaps add a bit less or is it really just to cut some of spice? Also, I have a whole bunch of little serrano peppers from my parents garden, could I use those? whoa. that looks fantastic!! I love mangos. I love spicy. I have to try it. mango + spicy, such a perfect combination. gotta try it. I'm a little late to the party, but I just checked out this recipe [looks amazing, on my "To Cook" list] and I wanted to let you know that those mysterious peppers are called "manzana" chiles. I found them in my local Mexican market a few months ago. Manzana means apple in Spanish, so that "eat like an apple" line is kind of ironic. My girlfriend and I just made this and used 6 mystery peppers. I think 5 of them may be scotch bonnet's and the other might be a cayenne. Needless to say our faces are just about melting off now! I'm really impressed at how good this is though. We will definitely be making this again! I made this last night after having it bookmarked forever. Mine didn't turn out so liquidy or even that bright. Did you puree your mangoes or something?